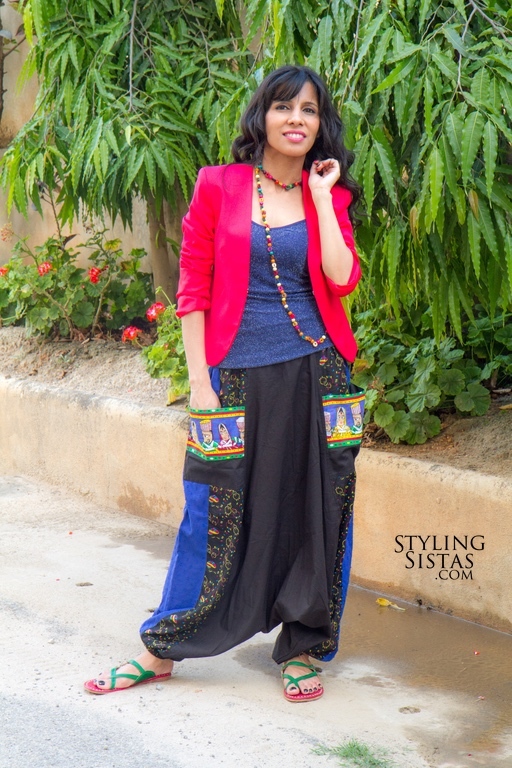 Ana adds some western flavor with the red blazer to this ethnic inspired ensemble. The fitted blazer accentuates shape of the upper body when paired with the loose harem pants and gives the needed warmth as it cools down in the evening. The sparkly cami has a fun peek-a-boo effect. Ana has kept the accessories to a minimum to not overdo the ensemble. And the green toe ring leather sandals keep the look casual for a stroll in an upscale mall or dinner at a restaurant.